President Xi Jinping speaks at the opening session of the 19th Communist Party Congress held at The Great Hall Of The People in Beijing, October 18, 2017. The February 25 announcement that the Chinese Communist Party (C.C.P.) has proposed a constitutional amendment that would remove term limits on the office of the presidency is arguably the most significant Chinese political and legal development in almost three decades, or maybe even four. It is a clear indication that Xi Jinping intends to—and, in all likelihood, will—stay in power beyond the two-term limit that both his predecessors adhered to, and therefore signals the ending of what one might call the “Deng Xiaoping framework” of Chinese high politics, under which lifelong rule by a single strongman gave way to regular retirement, rotations, and collective decision-making. At this point, it would be quite surprising if Xi retired even after three terms in power. Although the turn towards single-person rule should hardly come as a surprise, given Xi’s massive consolidation of power over the past five years, the fact that it involves a formal constitutional amendment was nonetheless unexpected. Most scholars and policy experts, myself included, thought that, even if Xi did manage to stay in power for more than two terms, he would do so by keeping the positions of Party Secretary and Chairman of the Central Military Commission, while some trusted ally would assume the post of President—à la Putin and Medvedev. The reason for this is that the presidency is, in conventional wisdom, by far the least important of the three positions that Xi currently holds, but also the one that is governed by the “hardest” and most formal rules—i.e., the Constitution. Were Xi to give up the presidency while keeping the other two, he would continue to be the unquestioned leader of the Party-state, while avoiding a politically and socially costly fight over constitutional rules. A constitutional amendment, in comparison, would be a luxury good, and just wouldn’t seem to be worth it. We were all wrong, of course, but the reasons for our mistake are perhaps more complicated than they might seem. The obvious explanation is that we underestimated Xi’s power—and, in the same vein, overestimated the strength of factional checks. In other words, he now has so much power that he can actually afford to “waste” some of it on this kind of luxury good, cost-benefit analyses notwithstanding. If you are indeed the supreme and unquestioned leader, with near-limitless amounts of power, then why not signal that in the most decisive way possible? That may well be true, but it remains possible to interpret Xi’s choice differently: maybe, for example, we’ve dramatically underestimated the importance of the Constitution, and perhaps of law in general, in Chinese high politics. The reason for the amendment might not be so much that Xi can afford a luxury good, but that it is not a luxury good at all. Instead, if Xi were to stay on for a third term without removing the two-term presidency rule, he would be taking on substantial political risks that outsiders fail to appreciate. The simplest of these could be that the office of the presidency might empower whoever occupies it to challenge Xi’s authority, even if that person was initially a trusted ally. This would necessarily assume that the office holds much greater sociopolitical significance than outsiders conventionally assign to it. But where does this significance come from? This is where the analysis gets more interesting: One could make a reasonably strong argument that Xi has consistently displayed a stronger appreciation of the legitimating power of legal institutions than his predecessors did. 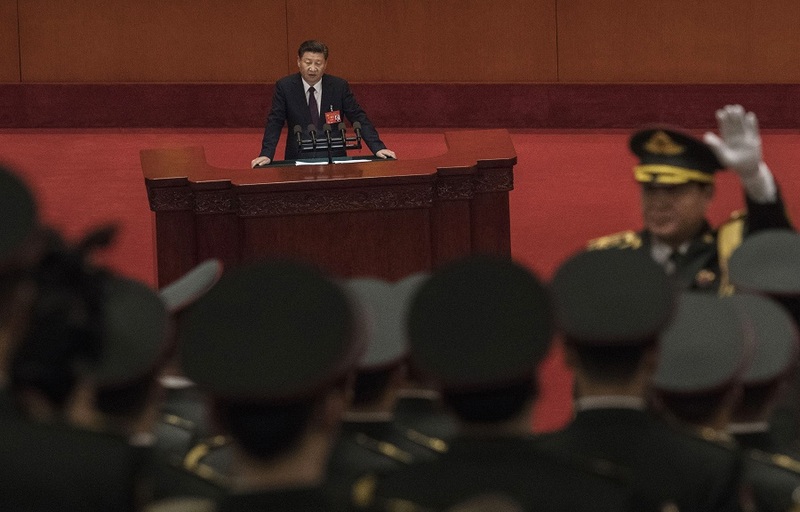 Somewhat paradoxically, he is China’s most autocratic ruler in over two decades, but has also empowered and formalized law enforcement institutions, especially the judiciary, to near-unprecedented levels. One could argue that the strengthening of law enforcement is emblematic of an expanding police state, but that would overlook the significant progress made in recent years on civil and administrative litigation. Courts are more independent, professional, and powerful vis-à-vis other branches of government (although not against the Party Leadership) now than they arguably have ever been since 1949. This suggests, however tentatively, that Xi may consider the law an important source of legitimacy and status, one that can be wielded against other political factions, interest groups, or bureaucratic systems. This makes sense if we see him as a disrupter and challenger of a deeply embedded political status quo, in which case he would need to tap sources of sociopolitical capital that were previously overlooked and underutilized—a description that applies perfectly to the legal system. Now, none of this would make any sense if legal institutions were not vested with, or at least could potentially be vested with, some sort of deep and powerful sociopolitical legitimacy by the general population. But both as a matter of current sentiment and as a matter of historical tradition, perhaps the Chinese population is more legalist than most outside observers tend to assume. Indeed, this is something that a number of scholars, myself included, have previously argued. Xi, as many have noted, is a populist of sorts, but he has also been surprisingly legalist. Perhaps these two things have some sort of underappreciated political synergy. Pursuing this line of thought, Xi’s reason for pushing a constitutional amendment may very well be that to do otherwise would be to risk losing a major sources of political capital, one that is much more critical to his personal success than would seem obvious to outsiders. He is someone who has wrenched power from other factions and branches of government through massive law enforcement campaigns and the empowerment of relevant institutions, and who regularly emphasizes the need to maintain control over constitutional interpretation and enforcement. Some might interpret this latter tendency as mere autocratic insistence on the primacy of the Party over the Constitution, but that would nonetheless imply that he understands the Constitution as something that must be controlled—and, therefore, something that holds major sociopolitical significance. Someone who has pursued these strategies may well be particularly wary of creating political tension between a constitutionally empowered President and the Party Secretary, and would therefore strongly prefer to occupy both positions. Just to be completely clear, none of this is to suggest that Xi is some sort of enlightened constitutionalist who deeply and normatively cares about the rule of law. Instead, it only suggests that he may understand how important law and the Constitution are as sources of sociopolitical legitimacy in contemporary China, and therefore may feel compelled to remove any incompatibility between his personal political ambitions and the formal legal structure of the state. In that sense, the constitutional amendment is still a power play, but it is a power play made under the assumption that law does matter. It is the move of someone who is trying to consolidate power, rather than merely flaunt or announce it, and should therefore be interpreted, at least to some extent, as a symptom of self-perceived vulnerability. The contrast between this move and, say, Mao Zedong’s willingness to co-exist with Dong Biwu (Acting Chairman of the Central People’s Government in the 1970s) is quite stark: Mao clearly thought there was little to gain from taking the position for himself, and also that there was little to fear from letting someone else be the nominal head of state. Xi may feel very differently on both fronts. In other words, the fact that the Constitution needs to be amended at all may be a sign that legal legitimation as a political force runs deeper than we previously thought. In this day and age, increasingly large amounts of power are derived directly from legally recognized governmental offices, making it increasingly risky for Xi to relinquish the presidency. The counterargument, of course, is that the very act of amending the Constitution is perceived in some intellectual circles as a violation of the rule of law, and therefore if Xi is truly cognizant of the legitimating power of law, he never would have pursued the amendment in the first place. This relies, however, on a substantially thicker concept of “the rule of law” than what is usually found in Chinese sociopolitical discourse. There is, after all, no real argument to be made that the amendment was somehow procedurally improper. Xi may very well have calculated that, over the long run, he had less to lose in terms of legal legitimation from forcing through a constitutional amendment than from coexisting with a potentially untrustworthy President. Assuming that Xi is not foolish enough to appoint a known adversary, what could render a former ally or subordinate untrustworthy? Well, “power corrupts,” but this assumes, once again, that the office itself holds real power. Finally, there is the question of consequences: over the long run, does the constitutional amendment strengthen or weaken the legitimating power of law? Most Chinese liberals, again applying a thick concept of “the rule of law” that mimics that of Western liberal democracy, would probably argue that the amendment exposes the constitution vulnerable to political manipulation, and therefore weakens its sociopolitical stature. I am tempted to think otherwise. By placing a constitutional amendment at the center of his push for a third-term—and, potentially, life-long rule—Xi, willingly or not, is actually boosting the social and political salience of law and constitutionalism. Since the amendment was announced, state media has rushed to argue that it is not merely constitutionally proper, but in fact strengthens the “constitutional foundations” of Socialism with Chinese characteristics. This is, to put it mildly, not a propaganda strategy that diminishes the Constitution’s sociopolitical stature. Taken on its own terms, it would actually place law and constitutionalism at the very center of political legitimation and governmental power. Even if this claim is received—as it probably will be—with widespread skepticism, it nonetheless provides a major boost to the document’s social visibility, and creates a political atmosphere in which both supporters and critics of the regime are much more likely to engage each other on legal and constitutional terrain. Over the very long term, the inherent arbitrariness of one-person rule could easily come into conflict with an underlying social preference for legal and institutional stability, but for now, Xi’s pursuit of absolute power seems to tap into, and will therefore reinforce, the legitimating power of law and legal institutions. Whether this is driven by sheer political calculation or some sort of personal ideological commitment remains unclear; liberals would undoubtedly insist on the former account, whereas the Chinese Left would probably prefer the latter. Whatever the case may be, the point here is that, even if China does become more autocratic and oppressive under one-person rule, it will not necessarily become more lawless. Quite the opposite, legalism and populist autocracy may very well go hand-in-hand for many years to come.